Nearly 600 young scientists from around the world have gotten the unique chance to participate in the 63rd Lindau Nobel Laureate Meeting, taking place from 30 June – 5 July 2013. They are meeting 35 Nobel Laureates in lectures, discussion sessions and master classes. 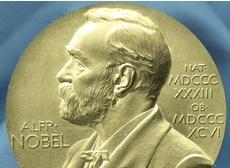 The scientific programme, dedicated to the Nobel Prize discipline of chemistry, include questions like “How does surface science contribute so solve global energy and environmental issues?”. Read blog posts and comments at the interactive forum of the Lindau Meetings. Mit echt nobel ist die Podcast-Serie der Max-Planck-Gesellschaft übertitelt.